This recipe is an homage to the many times we have enjoyed this dish in Chinese restaurants. Here the tofu has been shallow fried in hot oil in a frying pan - but for a really authentic treat, deep fry it instead and even dip it in a light tempura batter first! Try and press the tofu first - this gets rid of most excess liquid so it crisps up better when you fry it. See the link below for simple instructions. 1. Heat the oil in your saucepan until it's pretty hot - you want the tofu to sizzle when it hits the oil. 2. Add in all the tofu cubes, followed by the chilli and spring onion. 4. As you are cooking, add a couple of good pinches of salt and pepper to taste. 5. 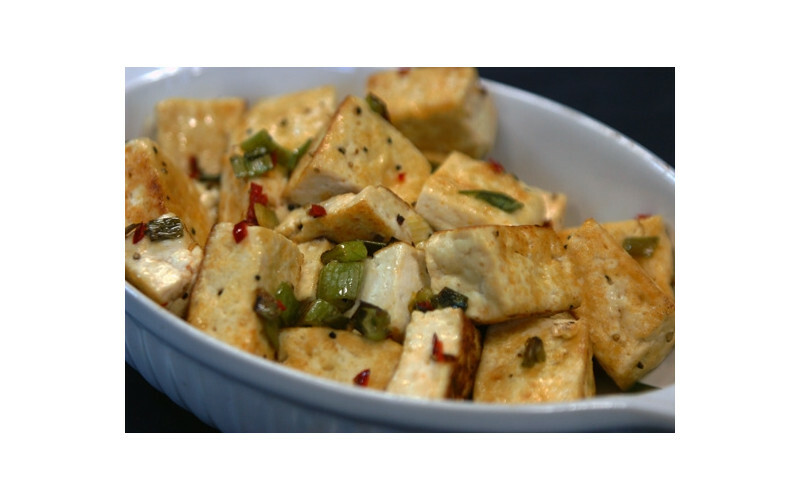 Serve immediately when the tofu is nicely browned and smelling amazing!